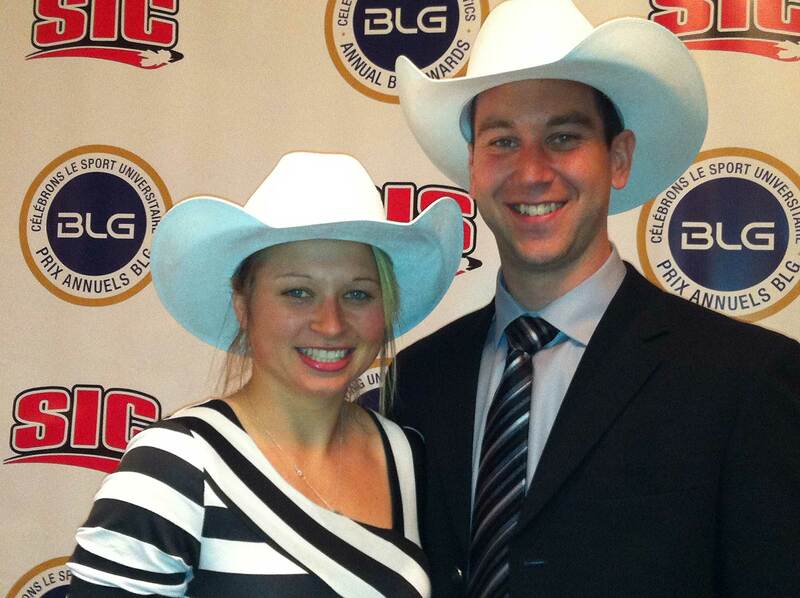 Martlets forward Ann-Sophie Bettez and Redmen defenceman Marc-André Dorion were named the 2012 BLG Award winners as Canadian Interuniversity Sport (CIS) female and male athletes of the year at a ceremony in Calgary Monday. It marks the first time that the BLG Awards go to athletes from the same university, and the first time that two hockey players are honoured in the same year. 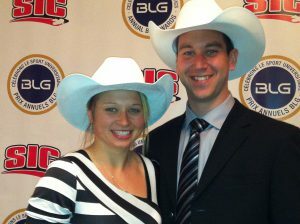 Martlets forward Ann-Sophie Bettez and Redmen defenceman Marc-André Dorion were named the 2012 BLG Award winners as Canadian Interuniversity Sport (CIS) female and male athletes of the year at a ceremony in Calgary Monday. The BLG Awards, based on athletic accomplishments, outstanding sportsmanship and leadership, were established in 1993 to recognize the top female and male athletes from universities affiliated with CIS. Each of the 52 CIS schools selects one female and one male athlete of the year. From these nominees, one female and one male athlete are chosen within each of the four regional associations. To be eligible, a student-athlete must have competed in a CIS sport for a minimum of two years and cannot be a previous recipient of a BLG Award. It marks the first time that the BLG Awards go to athletes from the same university, and the first time that two hockey players are honoured in the same year. The RSEQ had swept the awards only once in the past, in 1999, when Concordia hockey player Corinne Swirsky and Sherbrooke track athlete Alexandre Marchand took home the trophies. All nominees receive a commemorative gold ring and winners are presented with a trophy and a $10,000 scholarship to attend a Canadian university graduate school. All eight nominees – one female and one male from each of CIS’ four regional associations – received a commemorative gold ring, while Bettez and Dorion were also presented with a trophy and a $10,000 scholarship to attend a Canadian University graduate school. A native of Sept-Iles, Que., Bettez took home the Jim Thompson Trophy, named after the late president of TSN and presented annually to the female BLG Award winner. Dorion, who hails from St. Hubert, Que., received the Doug Mitchell Trophy, named in honour of the BLG Awards founder and Chair of the Canadian Athletic Foundation. He became the first-ever male winner from McGill. Two former Martlets, hockey player Kim St-Pierre (2003) and track and field star Linda Thyer (1995), had the Jim Thompson Trophy before Bettez. Dorion was named the top defenceman in CIS men’s hockey for the second time in three years and MVP of the OUA East Division after he led all CIS rearguards in scoring with a 7-32-39 mark in 28 league contests. The first blueliner in history to lead the Redmen in points, he then guided McGill to a third OUA banner in four seasons and its first-ever University Cup national title, earning all-tournament status at the CIS championship. Dorion, who graduated as the highest-scoring rearguard in school history with a 38-154-192 record in 174 games overall, ended his university career with three selections as a first-team all-Canadian. A veteran of five QMJHL seasons who received NHL tryouts with Dallas, Phoenix and Toronto over the years, he recently signed a two-year contract to play for EHC Linz, the reigning champions of the Erste Bank Eishockey Liga, the top league in Austria. The physical and health education student also excelled in the classroom at McGill. Last fall, he was honoured as a Top 8 Academic All-Canadian, out of over 10,000 CIS student-athletes. Bettez was named CIS player of the year in women’s hockey this season after she finished second in RSEQ scoring with a 13-24-37 mark in 20 league games, before leading the Martlets to the Quebec conference title and a bronze medal at the CIS championship. The 5-foot-4 forward tallied 13 points, including six goals, in eight post-season contests. Bettez, who graduated last year with a bachelor of commerce degree and recently completed a public relations diploma, wrapped up one of the greatest careers in the history of CIS women’s hockey in 2011-12. A former CIS rookie of the year and a two-time conference scoring champion, she was selected an all-Canadian and a first-team RSEQ all-star each of her five campaigns, while helping McGill to five Quebec championships and as many CIS medals, including three national titles, one silver and one bronze. The 24-year-old is McGill’s all-time leader in goals (85), assists (87) and points (172) in 91 regular season matches and also owns the team’s overall records in all three categories with 148-175-323 in 196 career games. The Awards ceremony will be broadcast on TSN on Saturday, May 26, at 1:30 p.m. EDT.